The tenant signing the present contract agreed on for a period of time, may in no circumstance prevail himself of an unspecified right to the maintenance in the places at the end of his stay. The reservation will be guaranteed by a credit card payment. All cancellations must be notified to the owner by email or telephone. – If cancellation occurs more than 30 days before the start of the stay, the customer will not be liable for any costs. – If cancellation occurs less than 30 days before the start of stay, 40% of the price of the accommodation will be charged by the owner. – If cancellation occurs less than 48 hours before the start of stay, the full price of the accommodation will be due to the owner. b) If the tenant does not manifest himself on the day of the beginning of stay, the contract becomes null and void and the owner may dispose of its guest rooms. The full price of the accommodation will be due to the owner. c) In case of a shortened stay, the price reflects the cost of accommodation is fully vested to the owner. Additional benefits not consumed will be refunded. The owner has to inform the customer of any cancellation at least 7 days before the event. The customer must present himself the specified day at the time stated on the contract. In case of late arrival, the tenant must notify the owner. It is recommended not to leave valuables in vehicles. 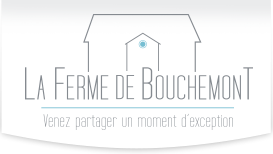 “The Farm Bouchemont ” can not be responsible for any incident. The balance will be paid at the end of your stay with the additional consumption and services not mentioned in the contract. Customer must respect the quietness of the place and use it according to its purpose. Customer commit to leave the rooms in good condition, and to respect the non-smoking policy of the premises grounds .